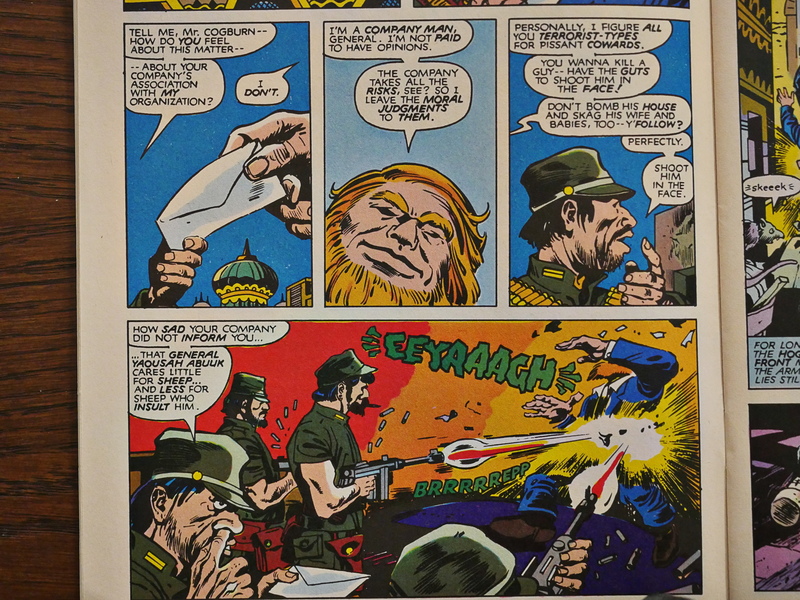 Destroyer Duck (1982) #1-7 by Steve Gerber, Jack Kirby, Alfredo Alcala et al. 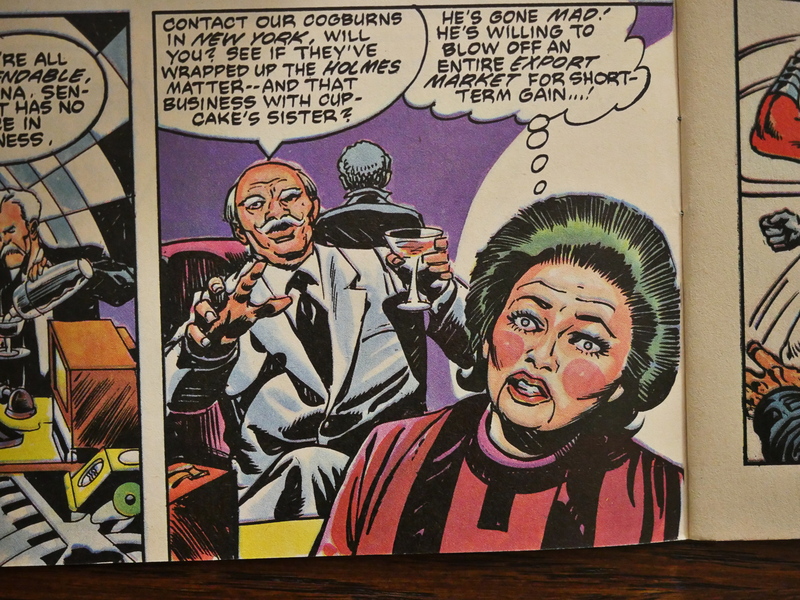 The first issue of this series is a benefit book for Gerber’s suit against Marvel over the ownership of Howard the Duck. 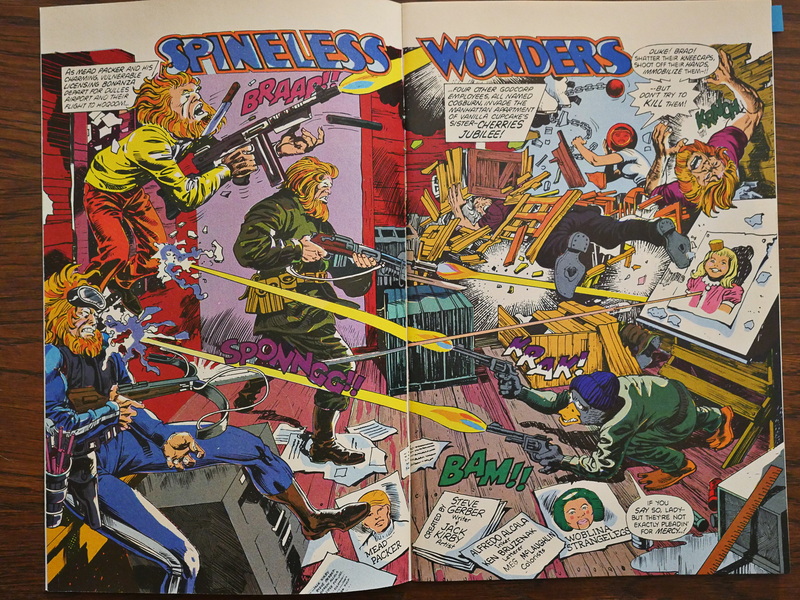 Gerber refused to sign any work-for-hire contracts with Marvel, and wanted his creation back. Marvel didn’t quite agree. If I remember correctly, the suit was finally settled some years later with … secret results, but Marvel kept the ownership, anyway. 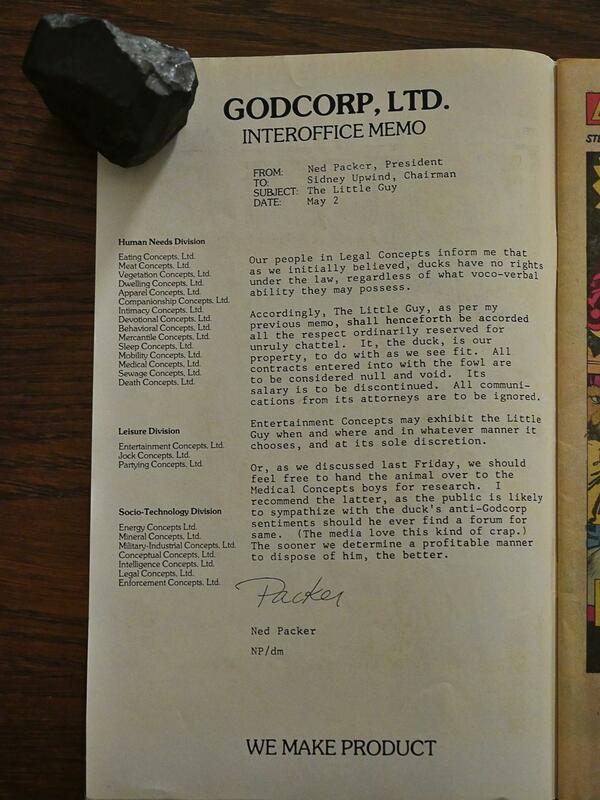 So here we have a satire over Marvel (in particular) and large corporations (in general) illustrated by another creator who was in legal squabbles with Marvel at the time, Jack Kirby. 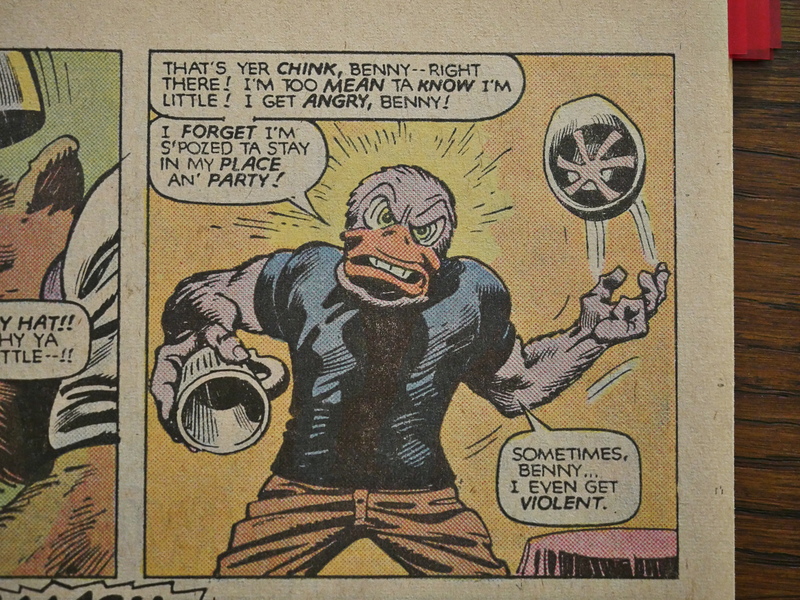 Kirby’s artwork is quite Kirbyish… But I’m not sure that’s the best duck face Kirby could have drawn, though. 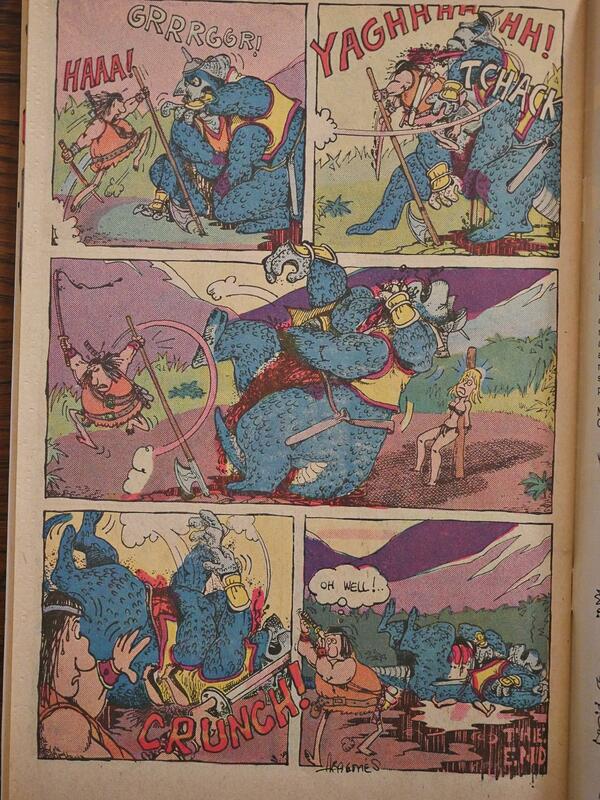 This is Eclipse’s first standard-sized colour comic book, and it’s printed on newsprint. It’s not really a very satisfying object to behold: Everything is muddy and indistinct. The storyline is basically that Destroyer Duck’s duck friend goes to our dimension and is then eviscerated by an evil corporation. 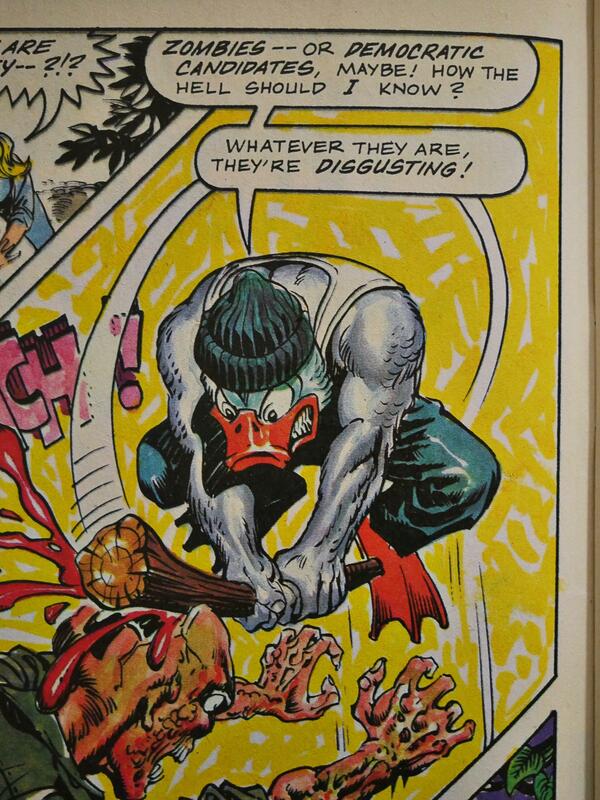 (Yes, that’s Howard the Duck.) 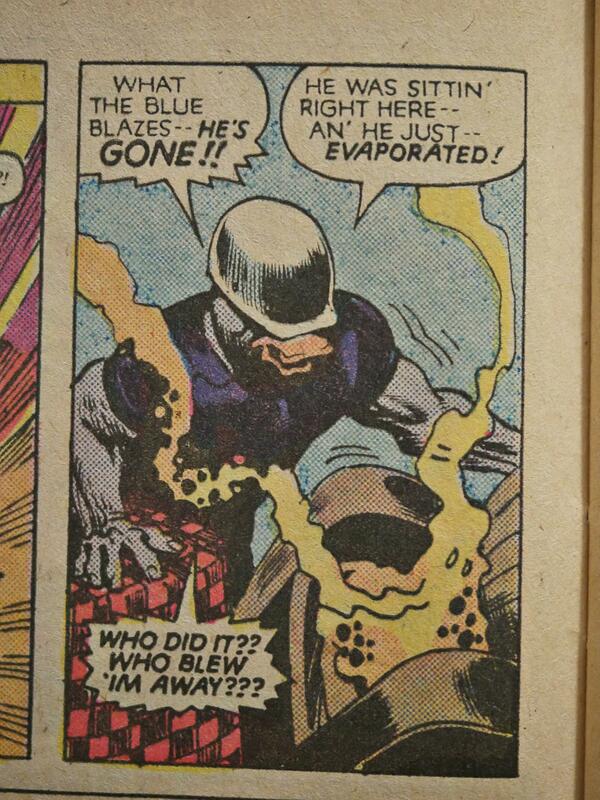 Destroyer Duck then wants revenge, and … things happen. Character and design wise, Kirby basically reuses a lot of his older designs (especially from the Fourth World era) with a few tweaks here and there. 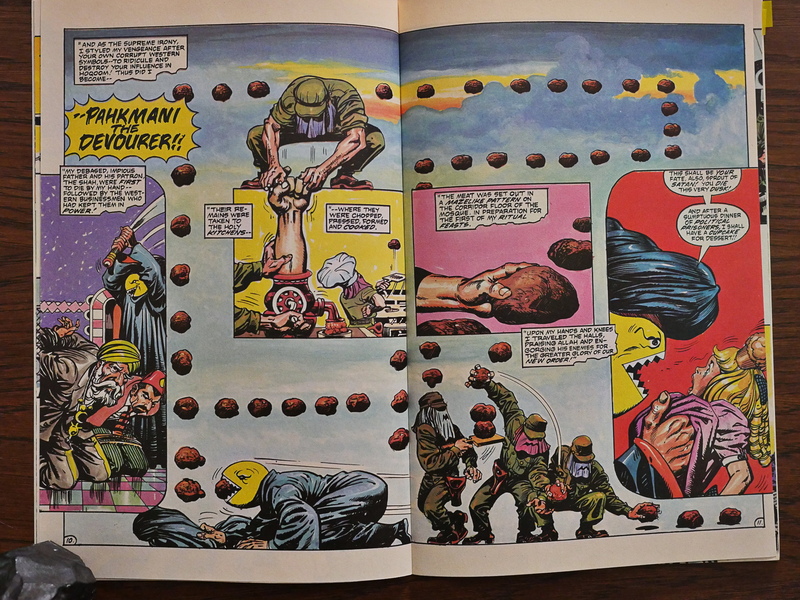 Since this is a benefit book, you’d assume that you’d get dozens of people rallying to fill the rest of the pages, but there’s just a handful of brave ones, none of whom are particularly Marvel-affiliated. Here’s part of a fun Shary Flenniken two-pager, for instance. 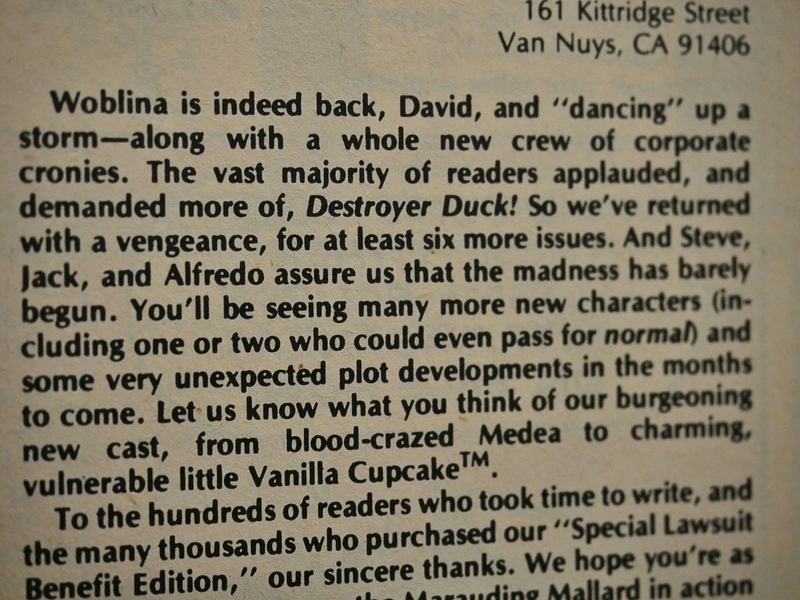 People didn’t rock the boat much in the early 80s: If Marvel was mad at you, you’d lose jobs. 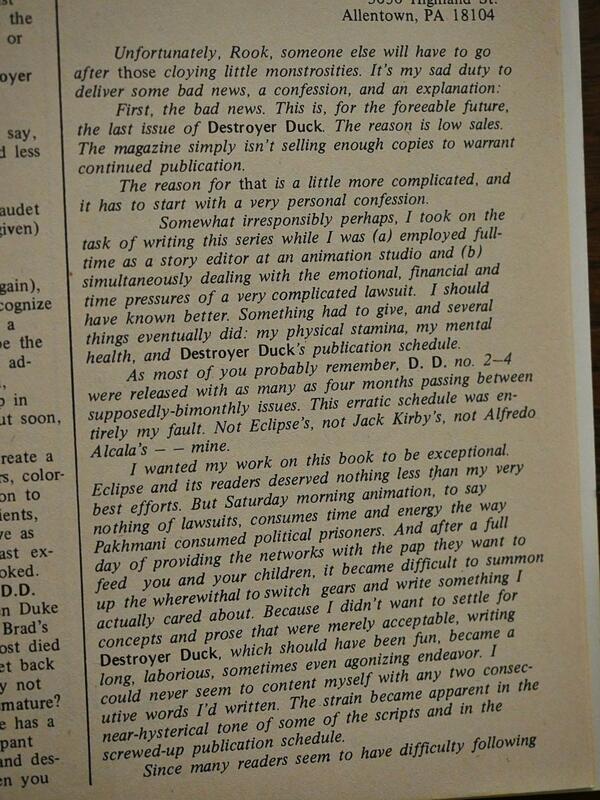 Gerber writes a thank-you page where he explains the point of the publication. 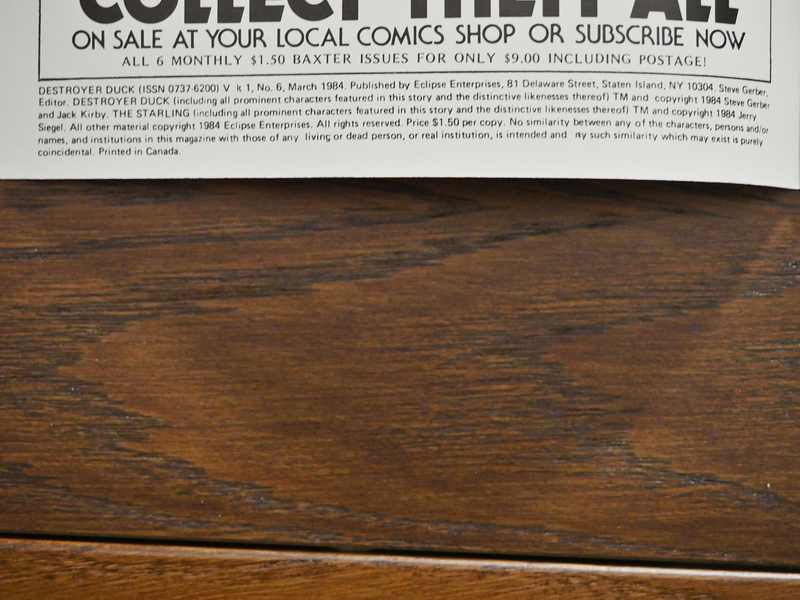 The rest of the issues are printed on much nicer (“Baxter”) paper, which allow the colour to pop more. Those nose-picking terrorists are Arabs. See? Gerber’s ahead of the times. 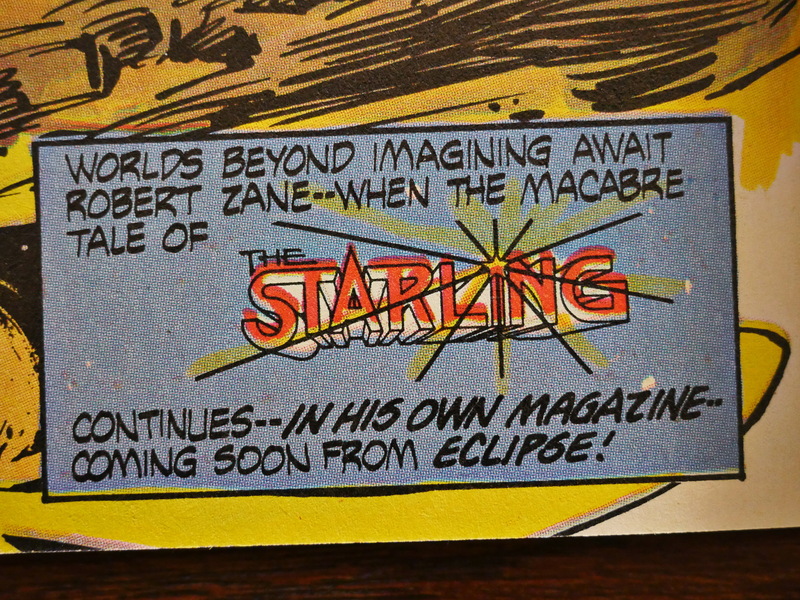 The backup feature for the six remaining issues is “Starling” by Superman creator (!) Jerry Siegel and Val Mayerik. And, yes, it’s about an alien that lands on Earth… but this time he just impregnates a woman and flies off, and the rest of the series is about his progeny. “At least six more issues.” It turned out to be exactly that, so we’ll played. 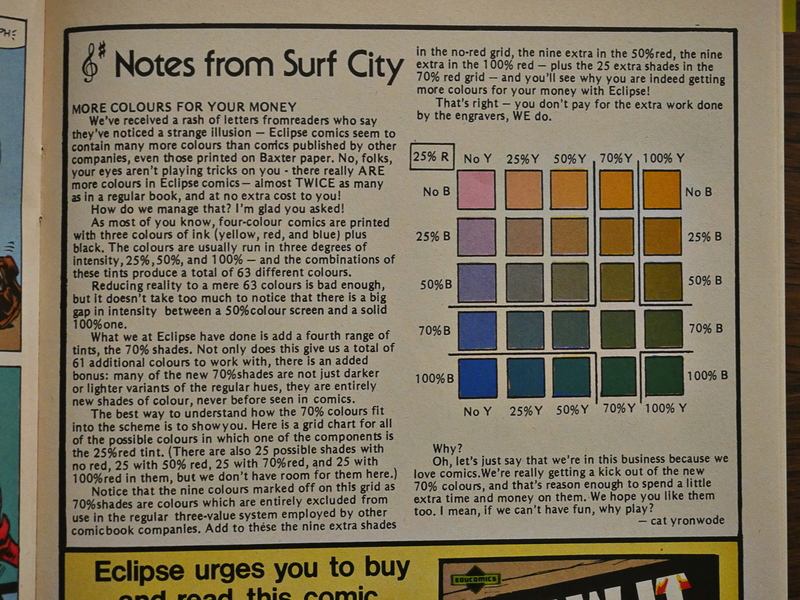 Eclipse brags about having a lot more colours than anybody else, because they also have 75% screens. I find stuff like that fascinating. Yes, I know. 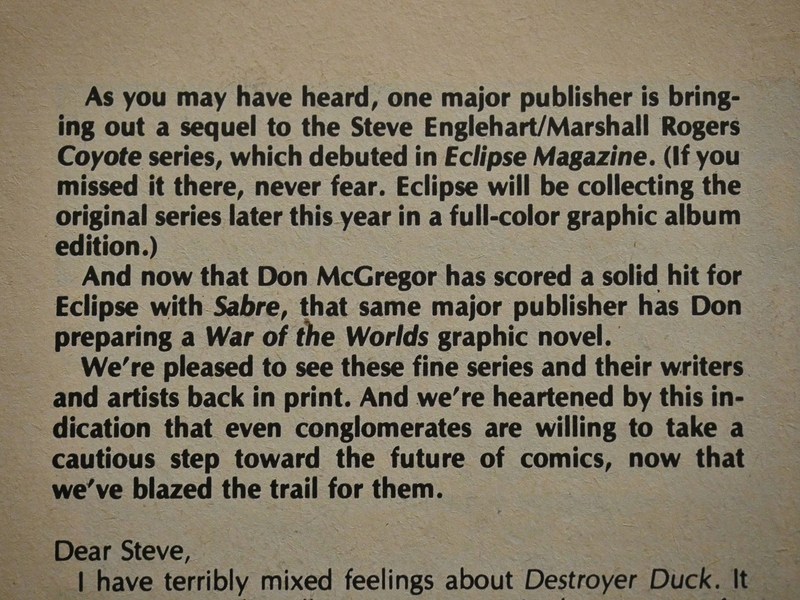 I assume this is Dean Mullaney writing about how he has no sour grapes towards some of the people Eclipse has published who have decided to go back to Marvel/Epic’s clutches: Marvel was scared enough by this exodus to Eclipse (and some other independent publishers) by some high-profile creators that they set up the Epic imprint where the creators retained the copyright to the things they created. But Mullaney isn’t bitter at all. I haven’t included a lot of Kirby artwork in this blog article, because I don’t really have much to say about it… I don’t think it’s Kirby’s best. 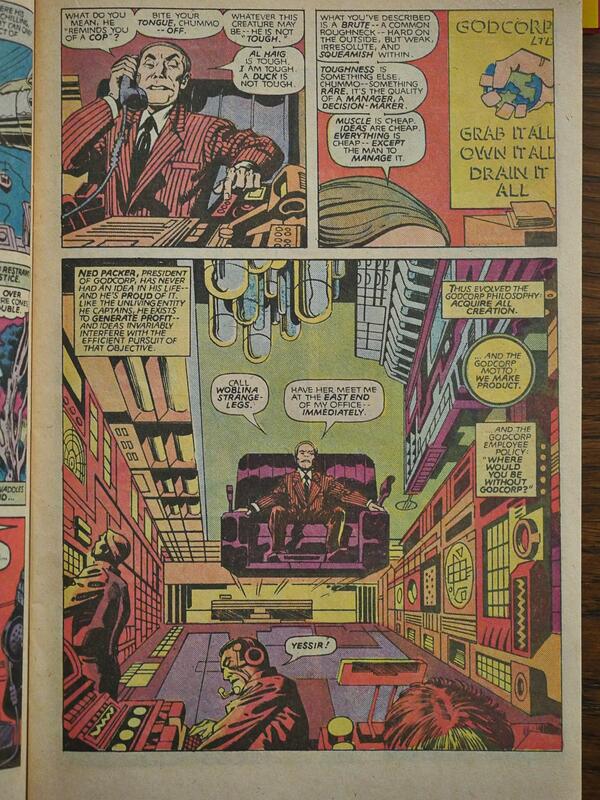 It’s perfectly fine, but it doesn’t really have that exuberant lunacy that some of his more inspired layouts have. 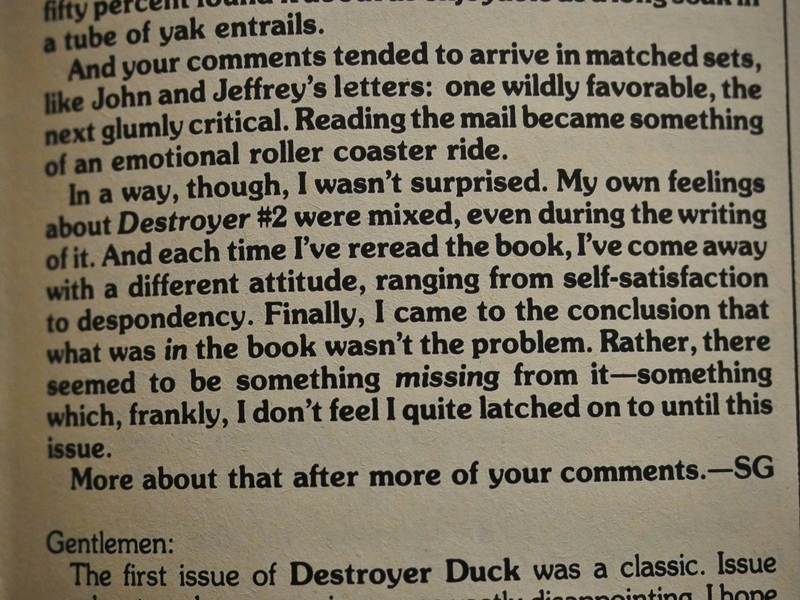 Gerber weighs in on his work in Destroyer Duck and is dissatisfied. I found this a bit amusing. 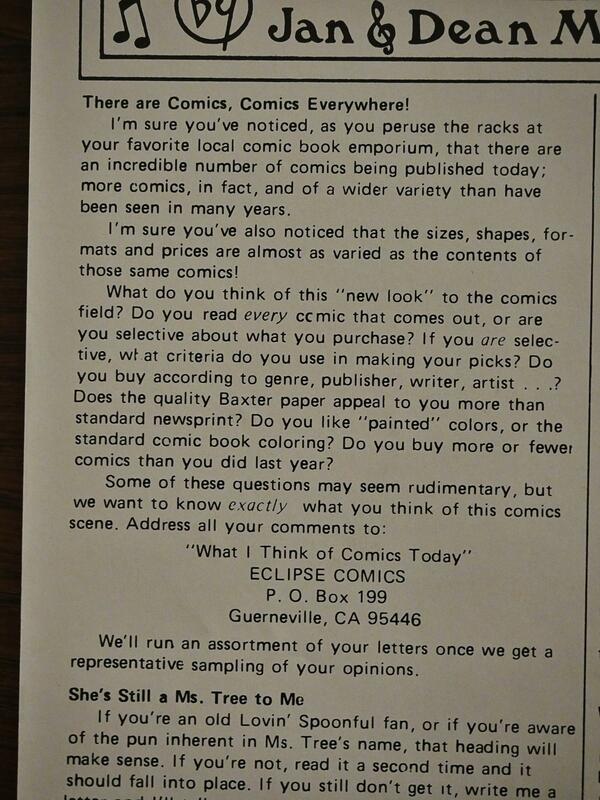 Eclipse solicits letters from people about what stuff’s important. Is it the paper stock or is it the artist? 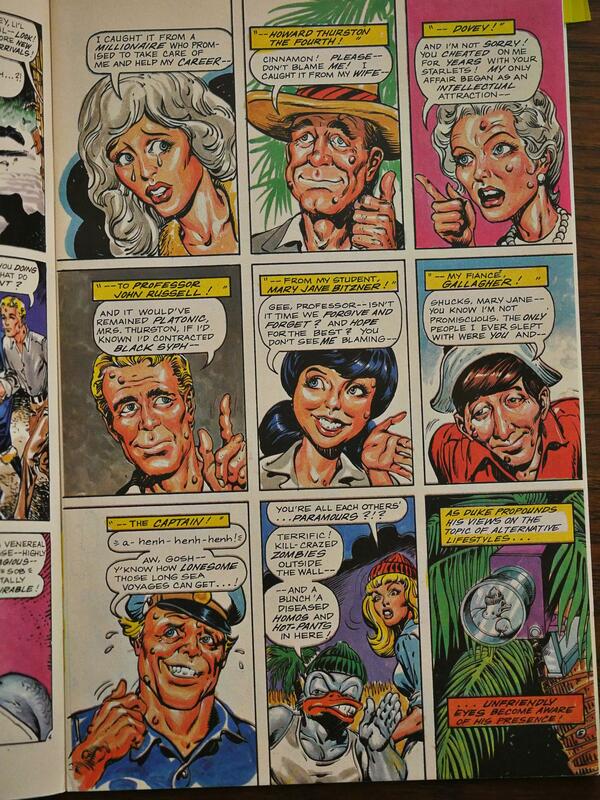 … but Gerber can be pretty amusing. And totally off the chain. That’s the new Ayatollah in Iran, Pahkmani, grinding up his parents and eating them like Pac-Man. It makes you go “hm”. Oh-uh! 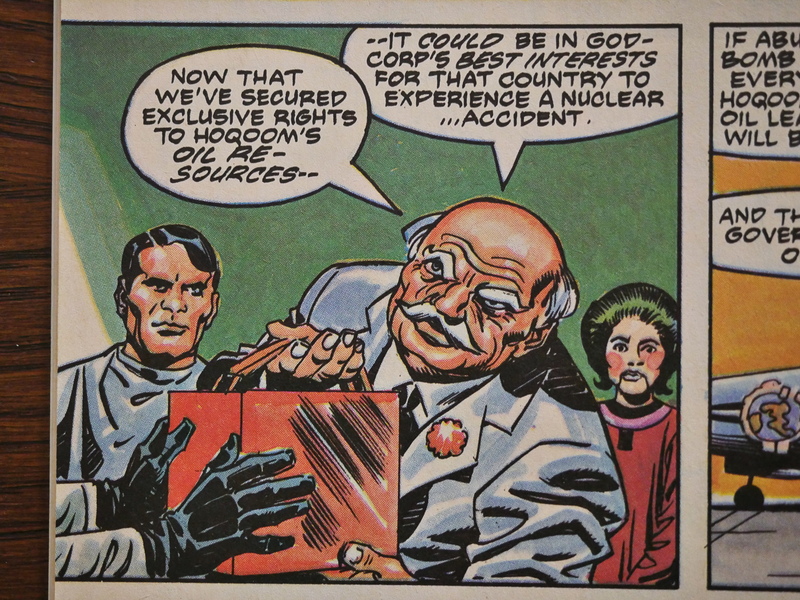 A clever reader picks up on the clever John Byrne/Cogburn thing. Gerber splats out the vowels so that he doesn’t get sued. 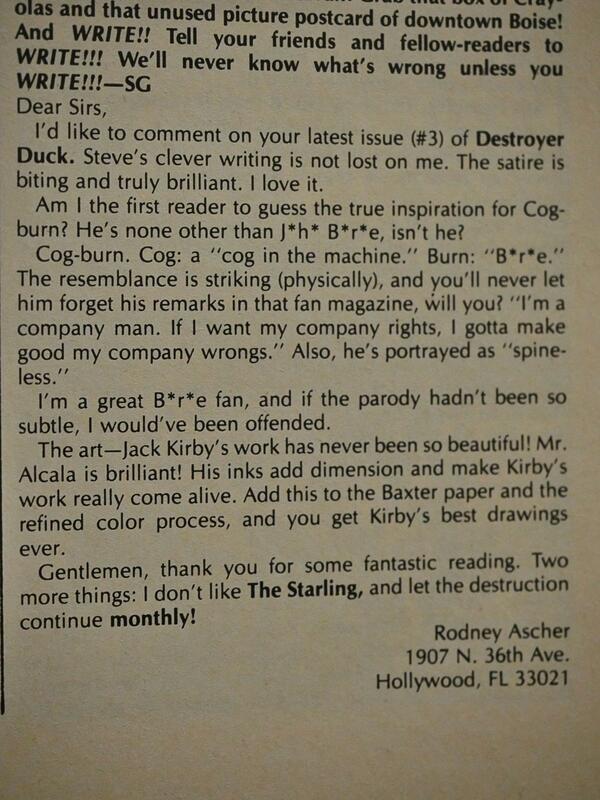 And then Gerber announces that he (and Kirby) are leaving Destroyer Duck. Whaaa? 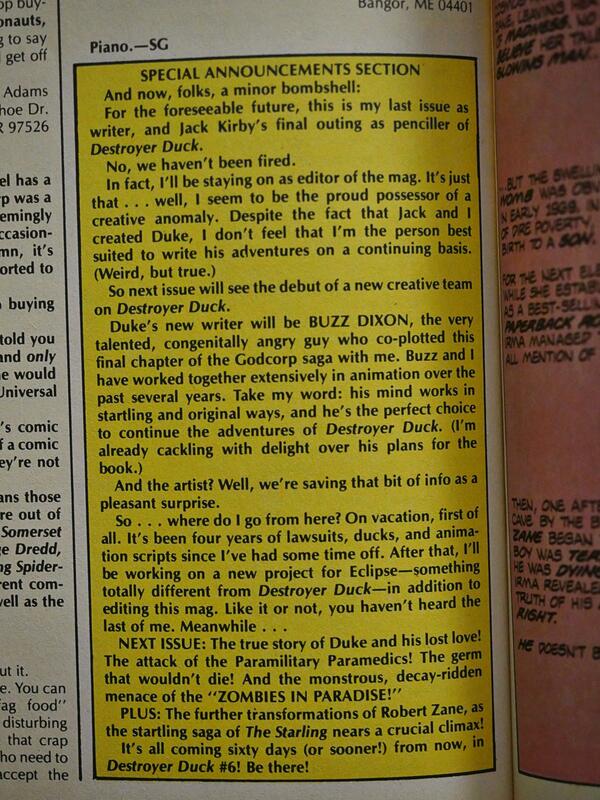 The next issue’s indicia mentions Gerber/Kirby/Eclipse as the copyright holders, but doesn’t mention the creators of the issue (Buzz Dixon and Gary Kato) at all. Wouldn’t it be ironic if this issue was made under work-for-hire conditions? Oh, I see. Buzz Dixon is a Republican. 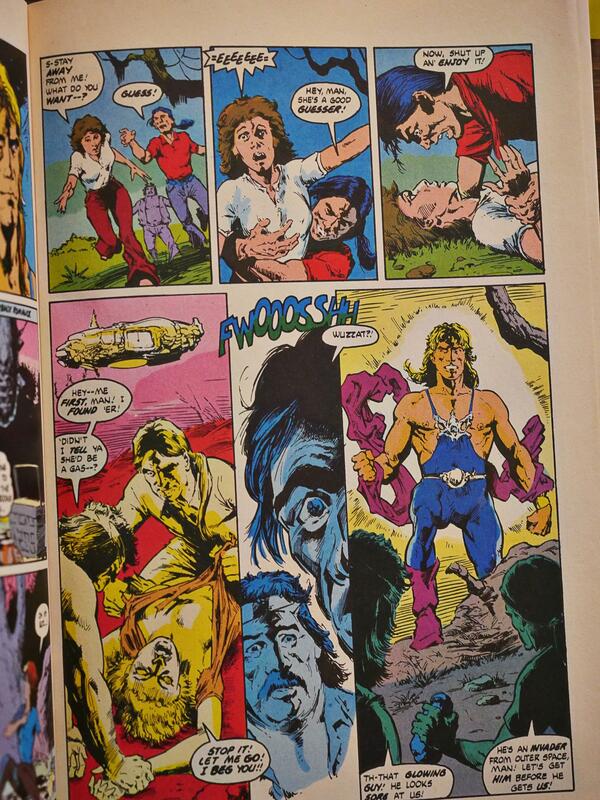 The two Dixon/Kato issues are pretty dire. The seventh issue has a pretty spiffy Frank Miller cover, though. I don’t think this ever happened? 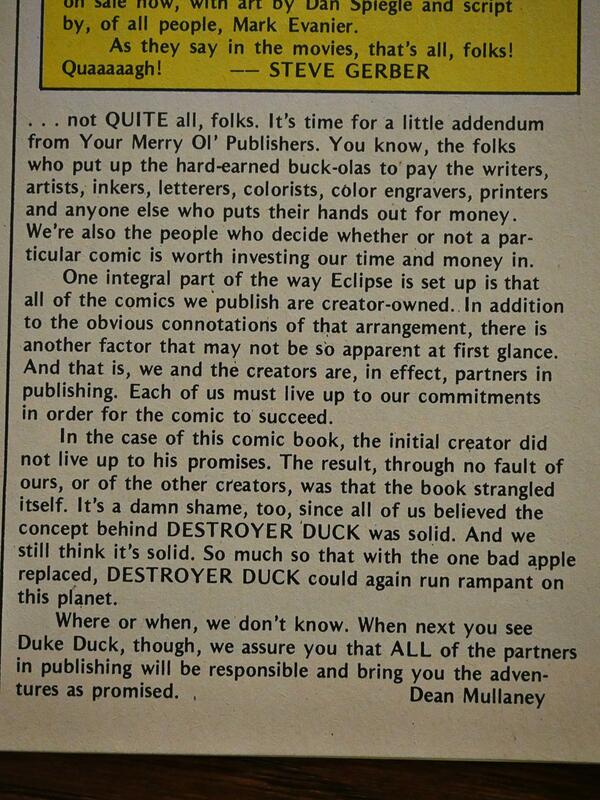 Gerber announces that Destroyer Duck is cancelled, and performs so mea culpas. He was late with his scripts because he cared so much, etc. Dean Mullaney (the publisher) gets the last word. 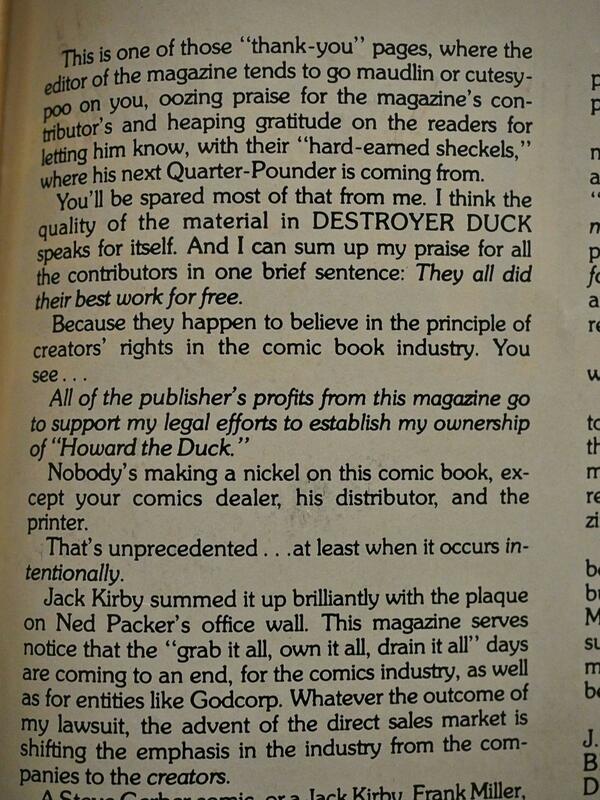 And is pretty harsh: “The initial creator did not live up to his promises.” I assume that’s Steve Gerber he’s referring to and not Jack Kirby. Join us on the refrain! 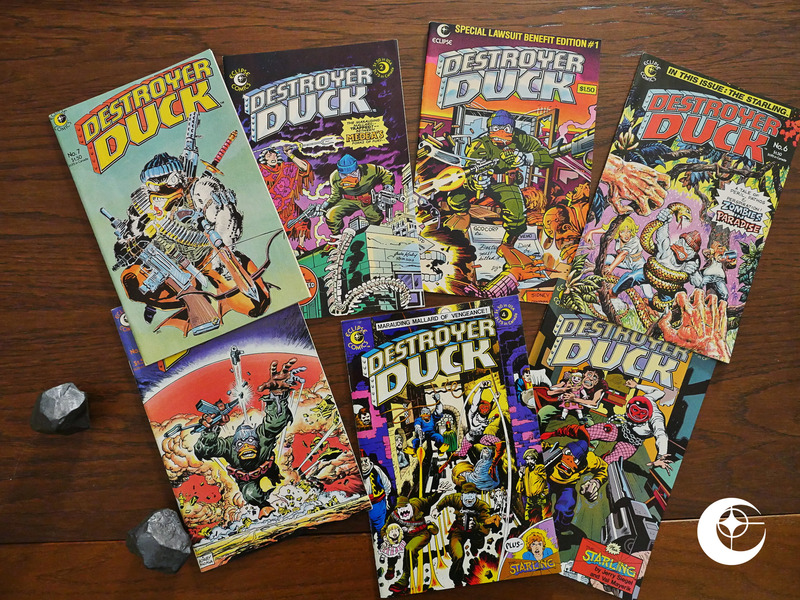 Destroyer Duck has never been reprinted. That Groo story in the first issue was, in fact, the first ever published Groo story.